One of the nation's largest grocery chains has implemented BrightSign's solid-state HD110 dynamic looping players to deliver digital signage to freezer end-caps in more than 680 locations nationwide. The project was designed and installed by ECI Communications Inc. and is used to display featured frozen food products and special offers from a variety of suppliers. The videos rotate in a loop to continually attract and keep customers' attention as products are highlighted. Since the installation was completed, the grocery chain has experienced a significant growth in frozen food sales from the freezers with video signage - as much as 3 to 5 times more than sales from the conventional freezers. Customer response has been so positive that the ROI for this project was realized more quickly than anticipated. Design/Integration Team: ECI Communications, Inc.
Project: Freezer "end-cap" digital signs deliver full-HD video and images on 26" commercial grade-screens mounted on top of freezers with the ultra-compact BrightSign HD110 digital media player discreetly hidden behind each screen. One of the nation's largest grocery chains wanted to increase frozen food sales while offering customers a unique buying experience they wouldn't find in other grocery stores. 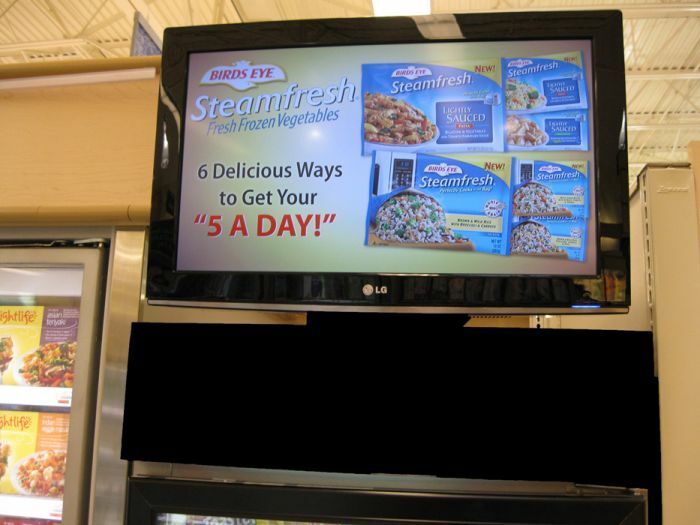 The objective was to install video signage in every frozen food section above the freezers to attract customers' attention, advertise various brands and compel additional purchases. The video signage had to fit esthetically into the store's look and feel, yet stand out enough to make an impact on buying decisions. It also had to be easily controlled from a central location so that video content could be changed or added at any given time throughout the entire chain or in select stores depending on marketing and sales objectives. The video signage also had to be durable enough to withstand 24-7 playtimes as well as be tamper-proof so that the units could not be altered or stolen. The video signage eliminated the hassles of manually changing the signage every week or every month and added a level of consistency and flexibility that wasn't easily managed before.